Guided by AU faculty, the students got hands-on practice with the tools of innovation and design at cutting-edge facilities like the Design and Build Lab (DaBL). “Entrepreneurship is creating something of value from nothing more than an idea. To shape an idea into a product by talking to potential customers and building prototypes through the DaBL is an amazing and unique opportunity,” says Bill Bellows, Kogod executive in residence and codirector of the AU Entrepreneurship Incubator. The students started off in the American University Center for Innovation, where Bellows taught them how to use customer discovery— the process of turning a vision into a business model—to develop ideas for the marketplace. Next, they moved on to the DaBL to create prototypes for their product concepts, which ranged from customized fidget spinners to a robotic dog. 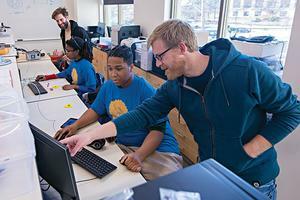 DaBL manager Kristof Aldenderfer and physics lab director Jonathan Newport helped the students use Tinkercad design software to visualize objects in three dimensions. When the time came for the big reveal, the high schoolers turned their ideas into physical products using the lab’s 3-D printers, electronics workbench, and other state-of-the-art equipment. The program culminated with product pitches by the students to a panel of AU science and business faculty, students from the National Science Foundation I-CORPS program, and external technology entrepreneurship experts. “Through the program, the students have learned the fundamentals of customer discovery, additive and subtractive manufacturing, design, assembly, and entrepreneurship,” says Kathryn Walters-Conte, director of the biotechnology master’s program and science coordinator at the College of Arts and Sciences (CAS). The students also met with School of Education (SOE) faculty to discuss how to apply their new skills to future internships and educational pursuits. The program was a real team effort by CAS, SOE, and the Kogod School of Business, whose faculty worked together to share their expertise with the Woodson students. “American University has an amazing cohort of faculty across many schools and disciplines who are genuinely invested in bridging the achievement gaps that sideline many of our talented DC Public Schools students,” Walters-Conte says. The next cohort of students will develop a ThinSat, a miniature satellite that collects scientific measurements and will be launched into orbit with a NASA satellite in April 2019.